C4A offers lessons on these instruments and musical styles. Please feel free to contact us if you are interested in lessons. 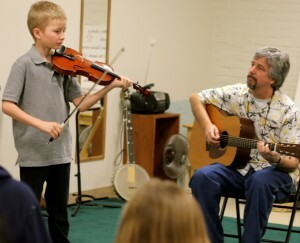 We’d love to find out more about your musical goals and match you up with the right teacher! Private Lessons Your private lesson will focus exclusively on you and your musical goals. Perfect for people who prefer individual attention or who are focusing on a particular musical endeavor. Our teachers tailor their approach to meet your needs. We offer 30, 45, or 60 minute lessons. Shared Lessons At C4A you can share a lesson with a friend and get twice the fun for half the cost! Perfect for pals or family members, this is available for guitar, violin/viola/fiddle, and flute players. 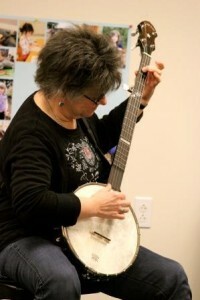 Please inquire if you would like to share a lesson on a different instrument. We offer 45 or 60 minute lessons shared between 2 or 3 people. All lesson times are arranged for mutual convenience of students and teacher. 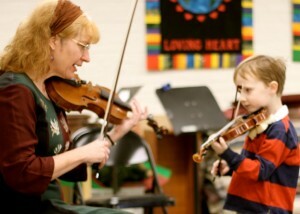 Fiddle: Emphasis on learning traditional dance tunes by ear and working on style/improvisation. Violin: Learn by reading or by ear, depending on your skills and goals. Learn solos, get help with your school music, play exercises to develop your technique, or tell your teacher what your goals are and get help with them. Viola: Same approaches as violin, but tailored to fit the viola. Cello: Learn by reading or by ear, depending on your skills and goals. 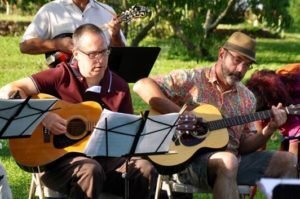 Learn solos, work on improvising and reading chord changes, get help with your school music, play exercises to develop your technique, or tell your teacher what your goals are and get help with them. Double bass (also called upright bass, or string bass): Learn by reading or by ear, play melodically, read chord changes and play backup parts, all while developing your technique. Guitar: acoustic or electric in various rhythm and lead styles, including flat-picking, finger-styles, jazz, and classical guitar. Mandolin: flatpicking & chording in various styles. 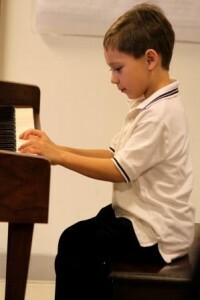 Piano: classical, jazz, popular; note-reading or improvisation. If you dream of playing another instrument not listed here, please ask. We’ll help you find a teacher if we can! Ethnic: Cajun, klezmer, tango, Irish, French-Canadian, Italian, and more!